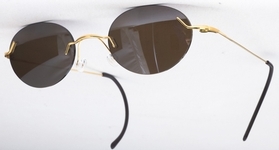 Rimless eyeglasses are simple compared to some designer eyewear, however, there are still design elements that need to be considered when buying a pair. Lens shapes vary, but the main design element is the temples / arms. For a classic look consider styles with thin, simple temples, or if you prefer to make a bolder statement with rimless glasses try a style with thick arms / temples for a trendier, more fashionable touch. 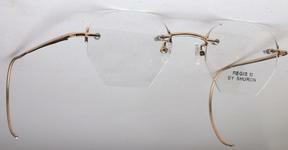 Half or semi rimless prescription glasses have a frame over the top part of the lens. Semi rimless eyeglass frames also create a minimalistic look that appears great on just about everyone. The metal frame around the top of the lenses typically identifies this type of eyewear while the bottom is “rimless.” A pair of half rimless glasses is a classy and refined look, but goes a bit further to focus on the wearer’s face than do regular rimless glasses. 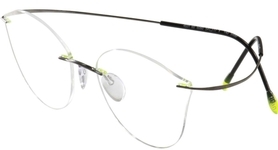 Due to the protective frame at the top, semi rimless eyeglasses have a greater resilience, yet are also lightweight. 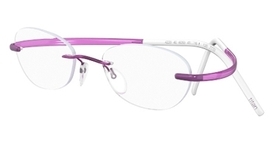 Rimless eyeglasses have been around for years, but there was a surge of interest in rimless glasses recently when Silhouette introduced the rimless Minimal Art collection. Because they lack frames, rimless glasses can sustain damage more easily than other eyeglasses designs. However Silhouette rimless eyeglasses are the lightest, stiffest, and easiest to wear of all the rimless eyeglasses Eyeglasses.com have tested. With such a variety of sizes, shapes and colors, you’ll have a wide selection of rimless and semi rimless eyeglasses. Eyeglasses.com offers brands from such eyewear designers as Silhouette for men and women, Humphrey's for women, the stylish Brendel line of semi and rimless glasses, the unisex Adidas glasses, Airlock, Harley Davidson, Liz Claiborne, to Cafe Lunettes with their uniquely designed templates, and other well known fashion brands The actual number of brands and designs for rimless and semi rimless glasses is quite exhaustive at Eyeglasses.com with a wide range of prices to suit every pocket book. There are so many semi and rimless glasses styles that range from geek-chic to classic to the latest fashion trendiness. At Eyeglasses.com we are confident you’ll find the perfect pair of semi rimless glasses or rimless glasses to fit your personal style.